Having lived in Harrogate I had long wanted to try a Betty’s cookery course and this Christmas themed day seemed the perfect excuse. Arriving early in the morning we were treated to a breakfast of fresh croissants with Taylor’s of Harrogate tea & coffee. We were introduced to our course tutors, two very experienced chefs from the Betty’s bakery who would provide lots of useful tips throughout the day. After being given our very own betty’s apron and a folder of the recipes we were ready to start. Our first challenge was a Christmas pudding and after the tutors demonstrated the process in the purpose built kitchen I was confident I could pull it off. 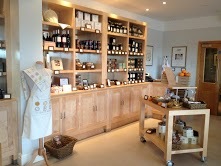 The scent of citrus and cloves filled the air and with Christmas music playing we were soon feeling festive. 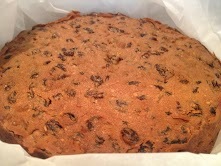 With the pudding safely steaming away we turned our attention to a Christmas cake, also surprisingly simple. Just time to prep our mincemeat ingredients then it was time for lunch. We were served fresh salmon fillets with baby new potatoes & courgettes in a rich tomato sauce. This was followed by a delicious dark chocolate & passion fruit bomb. After being plied with more tea and coffee we had a quick blast of fresh air with a stroll in the herb garden before we headed back into the kitchen. 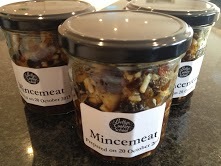 We finished off a mincemeat and poured it into jars ready to keep until December when it can be used to make mince pies. A quick mincemeat streusel tart then it was time for more food. This time we were served a zesty lemon cake from the bakery with more tea. Finally we were shown how to make a basic Béchamel sauce and how we could add different ingredients to transform this. With the addition of rum and sugar it was ready to accompany our streusel tarts. At the end of the day we were given samples of the finished products to try before packaging up our efforts to take home. It was an extremely well organised day and well worth the course fee. As well as being able to take home the food and apron we also left with a wealth of knowledge passed on from the friendly tutors. I also left with Betty’s chocolates and biscuits having been unable to resist the well stocked cook shop within the school. I look forward to trying my cakes and puddings this Christmas and using the recipes year after year to create my own Christmas classics. You did all that in one day and you still had time to enjoy a scrumptious lunch and teas and all, sounds like my kind of day. Some mum’s just have it all and two adventurous daughters as well. One request, the Greedy Sister who attended the one day course should post a photo of herself wearing the Betty’s apron! You make it sound so simple and the Christmas cake looks splendid. Wow! Bon appetit for your “White” Christmas. Bon journee.